Have a question for Tourane Hotel? 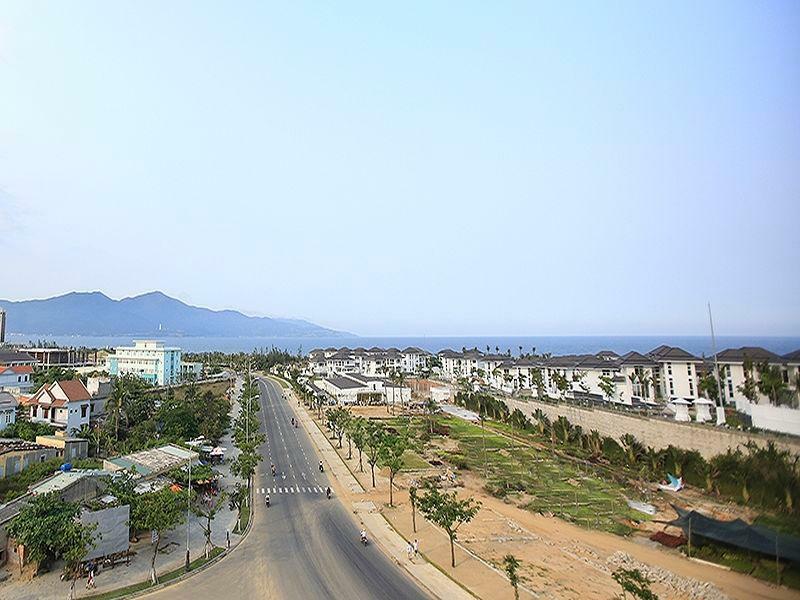 Just three kilometers from Da Nang International Airport, Tourane Hotel is ideally located on one of the area's most beautiful beaches. In the popular town of Da Nang, the hotel is close to many of the city's most famous landmarks, including The Champa Museum and the very famous limestone hills of Marble Mountain. The hotel offers modern accommodation with 82 spacious guestrooms featuring a large bathroom and basic amenities such as air conditioning, satellite TV, and a fully stocked mini bar. The Tourane Hotel houses an excellent restaurant that serves local Vietnamese dishes as well as Western favorites. The hotel also offers guests the use of the large swimming pool, tennis and badminton courts, and a very relaxing health center complete with a spa and sauna. this hotel has a very beautifull location. it is very near to the ocean and has a nice view on the ocean. the breakfast had a big variety and was very good. fresh juices and fresh fruit. it is quit near to the tourist area with a lot of bars and shops. lots of backpackers. Well past its glory days, the Tourane is apparently being allowed to disintegrate as its high-rise successor takes shape on the main part of the property - but that is no excuse for the staff to be so disinterested and unresponsive to requests. There were no bath towels in the room when we arrived, and we had to ask twice before they were provided. A bathroom light also burned out, and our request for this to be replaced went ignored. But worst of all, never in years of travelling have I refused the included breakfast. The food looked OK, but the utensils and crockery were dirty, chipped and cracked (with free human hair for somebody). We walked out and went elsewhere. Similarly with the guest rooms. Though the cleaners came in, the floor remained greasy and dirty. Half the safety catch on the door was missing, the only window with some semblance to a view had a decorative (?) wall-hanging over it, and the room was musty and damp (including the two new towels). Also neglected is the swimming pool. While the water was clean, tiles in and around the pool were cracked and could be hazardous. Because of its position opposite the beach, the new stylish Tourane building could be great - but if management can't attend to basic cleanliness and requests, one is not really keen to risk it. It was not good at all, We had a small room at first but it was horrible, small windows, old furniture, stuffy and dirty I had to upgrade to a bigger room with seaview. However this room is too close to the street, it was noisy at night. The top of the bed is leaning against the windows, it gave me headache. Breakfast was horrible. Staff is not friendly nor helpful. I'll never stay in that hotel again. Great value for the price. Hotel is not luxurious, but the location is terrific, staff very friendly, and the room comfortable. Only negative is that there was no ocean view from my villa, as advertised. I would stay here again, mainly for the price and location. Also, the pool was clean, warm, and very refreshing. great location with just opposite beach side. nice swimming pool not satisfied with receptionist, unfriendly . breakfast serve without menu, the worse server cant speak english, we cannot order what we wish to have. We requested an ocean view and we got one if you left our room door open,looked over the hall through the other door onto the balcony, then yes we had an ocean view. Air conditioning was a pain, it blew straight onto bed. Very handy to china beach, which was absolutely lovely. The area is very very clean, no rubbish. Breakfast was very asian. Not even a cup of tea. Didn't even have toast. The swimming pool was prestine. Very clean. Reasonable price for a OK hotel with nice location and breakfast included in Da Nang city Nice Swimming pool Good breakfast buffet with nice view to the sea. But: The interior furniture is really old ( maybe 1990s ) We had 3 rooms and all the showers were broken, There no lift at all. Amazing - I paid a little extra for the deluxe room which was like a palace! Most memorable and authentic Asian room I have ever stayed in. Is a bit of a shame some of the paths and poolside need a bit of work and the breakfast was a bit ordinary. Still recommend though. Firstly the pictures of the hotel don't even come close to what it's like in real life. The entire garden is dead and the buildings are deteriorating. The pool seems to have been maintained though. The staff were ride from the moment I arrived and were unhelpful. They didn't even have a map and couldn't direct me to where I can find one. The room was clean but none of the windows closed properly so I felt entirely unsafe the whole time. There is a giant construction site next door which continued to jackhammer and be active until after 2am in the morning. The location is directly opposite the beach but being the rainy season it was entirely empty and felt like a ghost town. Overall the hotel is below average and is deteriorating whilst other new buildings pop up around it. Stay clear of Tourane if you are looking for a comfortable holiday! Hotel is al ittle bit run down. Breakfast room is messy. They are building a brand new resort, so it might improve. We chose this hotel because it is close to the beach and it has a swimming pool. But immediate surronding is not great for lunch, shopping. ATM is far away. The staff were unhelpful, and seemed to laze around the pool a lot making it pretty uncomfortable. The rooms were bare and rundown. Toilet seat was broken and there was ants all through the bathroom. Rubbish around the grounds that was never collected. Back in the day am sure it was a great place, but now very run down. We also needed a taxi to transport us to the airport very early and it took us 2 requests to have this, and still no cab at the early time of 5am....we had to get a security guard to call one for us in the end! Wouldn't recommend this place to anyone. We had ocean view, but could hardly see anything due to big treas.Room was dirty, a lot of small insects crawling all over. The fridge was smelling awful. Heater for water not function. Day 2 they asked us to change room because they should do something there. Better and more clean, but no balcony which was 1 reason why we booked there. They are now making new hotel, and big machines was smashing down 1/2 of the hotel while we was there.Think it could be a good place when all is rebuildt with about 20 floors. Lovely beach and promenade. Old hotel with bad rooms. Photos must be at least 10 years old. Doors and windows could not close properly. No English speaking staff and no service at all. Breakfast in worn down "restaurant" and only for Asians. Pool looked OK.
Really nice big room with two lovely big clean beds. Well spread-out hotel in garden surrounds (which would do with a bit more general cleanliness and maintenance). Breakfast was lacking in fruit and as a result a bit of a disappointment. We stayed at Tourane Hotel for one night before travelling to Hoi An. This has been one of the worst places we have stayed whilst travelling around Asia. When we arrived the receptionist could barely speak any English. eventually they decided to give us a room. The room was a huge room but the walls had mould and the window wouldn't shut properly and could have easily been broken into, the door was dodgy as well and even when locked didn't seem safe. Overall we weren't happy with our stay here and could have stayed somewhere a LOT cheaper and nicer. Excellent location with lots of restraunts close by. A short ride to all the sites in downtown. Hotel was a little dated. Most of the security/staff were friendly but did not speak english. a great pool to cool off in. we just stayed for 1 night. the pool is good and nice for a swim. the beach is right on the other side of the street. there are a couple of nice restaurants withing walking distance on the left side. would not stay there more than 1 night. room was ok for a 1 night sleep. there is absolute no service, we even had to fight for beach towels. would not recommend the hotel. China Beach is essentially split into two parts: Danang in the north and Hoi An in the south, with huge luxury resorts in the middle. Danang is where the Vietnamese go, and Hoi An is where the tourists are, so it depends on your preference. The actual hotel has a nice swimming pool, useful for when the sea is too rough to swim and the red flags are up. The deluxe twin room we had was huge but the restuarant is unfortunately not up to scratch so do not expect much of a breakfast. None of it's 3 stars was awarded for the food but the staff were reasonable considering it was a Vietnamese oriented hotel.